Rats nibble on stray pieces of soldier as the Battle of Amiens — the beginning of the decisive Hundred Days Offensive that eventually won the First World War — unfolds in semiglorious CGI. While working-class infantrymen run bravely into a fusillade of German bullets, Captain Matthew Crawley, the cleanest soldier in His Majesty’s Armed Forces, exhorts his chaps and dances neatly through the carnage. For a time, that is. Soon enough, one of the Kaiser’s shells takes aim at Manchester’s bravest solicitor, sending him flying, his life saved only by the heroic self-sacrifice of William, his dependably cheery footman. (Apparently martyrdom is just as important as knowing where to place the salad fork.) As the two lie unconscious or worse in the French mud, a shadow passes over the women of Downton. Daisy suffers a momentary fugue state as she stirs the parsnips while Lady Mary sends a china tea cup tumbling; neither logic nor the English Channel, it seems, can separate these swoony soul mates. A chill is felt in my apartment in Brooklyn, too, as a shadowy Edwardian hand appears and neatly snips the ropes and pulleys that had been suspending my disbelief throughout this soapy second season of Downton Abbey. “I won’t be sorry when this one’s over!” William cries just before being blown to (United) Kingdom come, and I can’t help but agree. Despite its posh trappings, Downton has always been wildly conventional, with a sudsy proletarian heart beating beneath the topcoat and tails. But last night’s episode went below and beyond the call of duty, larding the melodrama like Mrs. Patmore with an unlimited suet budget. It’s not just that everyone keeps coming back to Downton — whether for parties or to convalesce. It’s that the entire show is now 100 percent devoted to manufacturing ways to keep these diverse characters under the same roof, logic and pacing be damned. It’s a precarious spinning plate trick using the Granthams’ best china, and while it’s possible to admire creator Julian Fellowes’s plot-twisting tenacity, the strain is beginning to show. Sure, the stakes were suitably raised in this fourth installment — a wedding, a death, and a potential paralysis will do that for a show — but the predictable nature of things, the crushing, kindly stasis of Downton itself, robbed the moments of their emotional wallop. Instead, the hour felt like the Royal Shakespeare Company performing a midseason episode of Private Practice. Not even the ardent Mr. Molesley could polish this dud. All of this would seem much more affecting, of course, if I believed any of it. After sending Lavinia away to a life of post-World War swinging on the fertile streets of London, Matthew apologizes for “blubbing” in front of Mary. “Now look at me, an impotent cripple stinking of sick. What a reversal.” This is as much a reversal as rain on one’s wedding day is ironic — when Mary was rejected by Matthew she stank of nothing but lilacs and lavender with a slight residual tang of Turkish musk — but the intention is clear: This is yet another in Fellowes’ long line of delays, roadblocks, and stalls en route to a swoony finale. If Matthew isn’t marching up and down the hills of Yorkshire like Branson on May Day by the finale, then I’m a dowager countess. Stay resolute, Lady Mary! Consider that bucket of upper-class vomit a down payment on future happiness. The rest of the episode’s emotional beats left me equally unmoved, particularly the return of Vera Bates, a villainess so ridiculous it’s a wonder she doesn’t have a mustache to twirl, a poison apple to offer, or a Dalmatian to kick. (To be fair, she might. It’s difficult to ascertain the genus of the dead furry animal she’s got hanging around her neck.) Returning to Downton because an eventually repentant O’Brien contacted her (and, really, the only thing worse than an over-the-top baddie is one who’s gone soft: Even Thomas melted like cheap butter at the thought of William’s untimely passing), she’s a tiresome, cackling cartoon, hissing at virtuous Anna and determined to destroy her limpy ex. We’re still not quite sure why, of course, other than the fact that Bates has managed to find chaste happiness with the Glinda to Vera’s sinister Elphaba. But for this tired plot, and for Fellowes himself, the play’s the thing, not the motive. Disaster is averted when Lady Mary comes clean about her dirty secret to Richard Carlisle, who, as a token of good faith, then buys Vera’s story and buries it, promising jail if she ever tries to peddle it elsewhere. 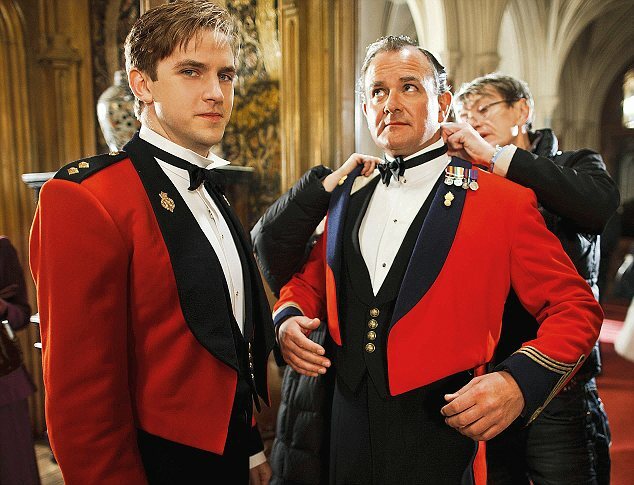 (It seems Sir Richard likes some wear and tear on his spouses. He also goes from glacially patient — in the time it’s taken Mary to ponder his proposal, Ethel has conceived and birthed an illegitimate soldier baby — to downright manic, announcing their engagement the very next day.) Vera stomps her feet and disappears in a puff of smoke — for now — while Anna returns to dreaming absolutely nonmetaphorical dreams about the bloom returning to her rose garden. The creakiest machinations were reserved for the Dowager Countess, however, who proves she has a heart — or at least a cold — by arranging to have William brought back to Downton. At first glance it appears his condition is more serious than the military bureaucracy itself, one that would leave him to die in a lower-class hospital, far from the loving gaze of his grieving father. Thankfully, he’s suffering from a severe case of internal Television Injuries, the sort that keep him alert and present right up until the inevitable end. Strangely enough, it’s only Daisy who emerges from this hour with any real dignity. As wheezing William’s deathbed is adorned with flowers, Mrs. Patmore and Mrs. Hughes act like moralistic, Bates-ian bullies, pushing a poor, confused scullery maid into early widowhood. Yes, William deserved a moment of happiness, but just how clueless is he meant to be? Daisy runs from his death room faster than the time she accidentally sprinkled mouse poison on the poundcake and yet everyone clamors for her to do the right thing and wed a corpse. By the end, when the soon-to-be-former-Mrs. Mason finally agrees to sit with her half-dead husband, you can tell it’s because she’s a good and patient person doing her very best to ignore the reasonable doubts swirling in her head. After this tiresome hour of Downton, I can relate.